The Universal Security Instruments MICH3510S 3-in-1 Smoke, Fire and Carbon Monoxide Smart Alarm provides 10 years of continuous protection against deadly threats in the home. New patented Universal Smoke Sensing Technology provides the benefits of both photoelectric and ionization alarms in one device to protect against fast flaming and slow smoldering fires. This combination alarm also features protection against the silent killer - carbon monoxide - making it a 3-in-1 device. The ideal addition for new or replacement installations, this maintenance-free alarm is suitable for houses, apartments and mobile homes in every room. This USI Combination Alarm utilizes a sealed battery (included) that will never have to be replaced throughout the life of the alarm, giving you a decade's worth in peace of mind even in the event of a power outage. Permanent Power also saves money from battery replacements (up to $38.00 over the 10-year life of the alarm), eliminates annoying low battery chirps and helps the environment by reducing environmental waste from disposed batteries. This 3-in-1 smart alarm features microprocessor intelligence to completely eliminate nuisance alarms, a single silence/test button to quiet a non-hazardous alarm and an end-of-service life warning that sounds when it's time to replace the alarm (approximately 10-years from activation). 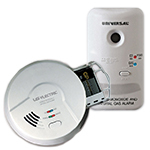 This 3-in-1 Smoke, Fire and Carbon Monoxide Smart Alarm conforms to UL217 and UL2034 standards. It is also California State Fire Marshal approved and Federal Housing Authority (FHA) approved to exceed industry standards. 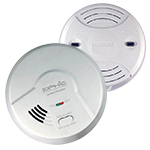 The Universal Security Instruments MICH3510S 3-in-1 Smoke, Fire and Carbon Monoxide Smart Alarm comes with a 10-year limited warranty that covers the battery and alarm. The CS Associate I dealt with was very courteous, helpful and took care of my needs on a timely basis, highly recommend doing business with Universal again. The units were easy to mount and tested OK. I wanted to replace the detector in my furnace area with a carbon monoxide alarm and this was a great way to get this done. It is working great and also easy to install. Bought two of these to replace old ones. Design seems great and actually fit using the same anchors and screws from other brand I was replacing. Glad our dog won't have to hear low battery warning any longer! 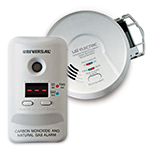 Like the convenience of having carbon monoxide monitored as well as fire and smoke in the same unit with the sealed long lasting battery. I bought several USI products for my own home -- including these -- about a month ago. Attractive and easy to install. I bought two more for my parents, and I am about to buy several additional items. Easy website to navigate and fast shipping.